There are many references to Hell in this period piece with its God-fearing ways, based on the classic novel, Huckleberry Finn. But you will find a little slice of Heaven on Earth in this delightful musical currently running South of the Border (Illinois-Indiana border, that is) in Munster, Indiana. Early in the play, Tom Sawyer and his pal Huck Finn are comparing their lives. Tom, played with the proper mischievous intent by Kyle Quinlivan, describes his life with Aunt Polly as "dismal." Huck does not care for being behaved and civilized with Widow Douglas. Both agree they won't end up in "the good place" as these proper women will in eternity. (Or as a friend of mine likes to say: "Heaven will have the boring people. Hell will be like Club Med!") Eventually, running away from society norms is what leads Huck on his big adventure with Jim, the runaway slave. The initial impression upon walking into the Theatre at the Center is, "Wow. Cool set!" 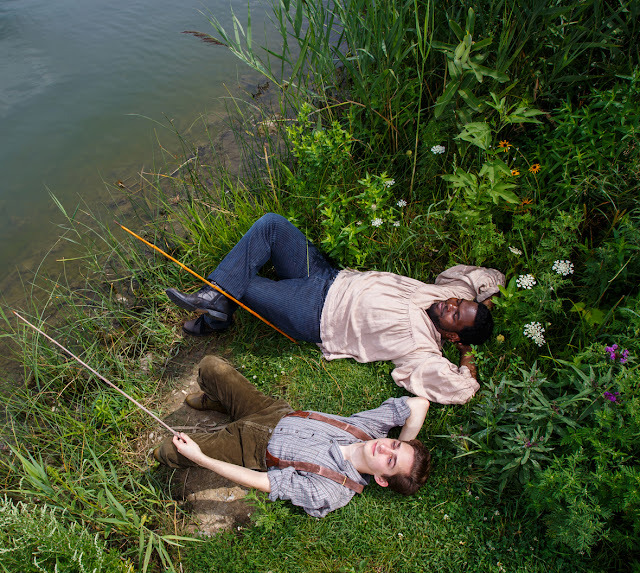 I wondered how the great Misssissippi River would be portrayed onstage as Huck and Jim navigate the mighty river. One level of the multi-tiered stage served as their raft, as they "steered" with oars. The band assembled onstage one at a time, in period costumes, which is where they remained the entire show. That is, unless a musician was performing double duty as an actor/singer as well in the show. 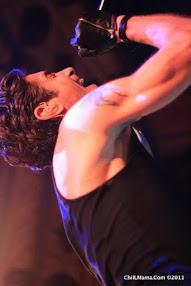 This multi-talented cast alternated from actor to musician continuously throughout the show. The two leads are standouts in this production. Jonathan Butler-Duplessis has a gorgeous voice as Jim; James Romney in the title role is charming and a triple threat of acting, singing, and dancing. Jason Richards as the Duke is also worth noting in his hilarious portrayal of an actor imitating Shakespeare plays in a very exaggerated manner. There is a poignant scene where Jim's search for freedom leads him to confide his big goals to Huck: to be reunited with his wife and children. He describes how he plans to "work hard and save enough money to buy" his wife. Then they will save enough money together to buy their two children. If their owner won't sell them, Jim is determined to locate an abolitionist to help steal them back. Twain was a helluva writer but a terrible businessman. He invested in outlandish ideas hoping to make a fortune. He went into incredible debt. He always dreamed of having a play run on stage for the royalties or "free money" a successful show could generate. Too bad he never saw that dream fulfilled because Big River would have made him very proud. Click HERE for further show details and ticket purchasing information. 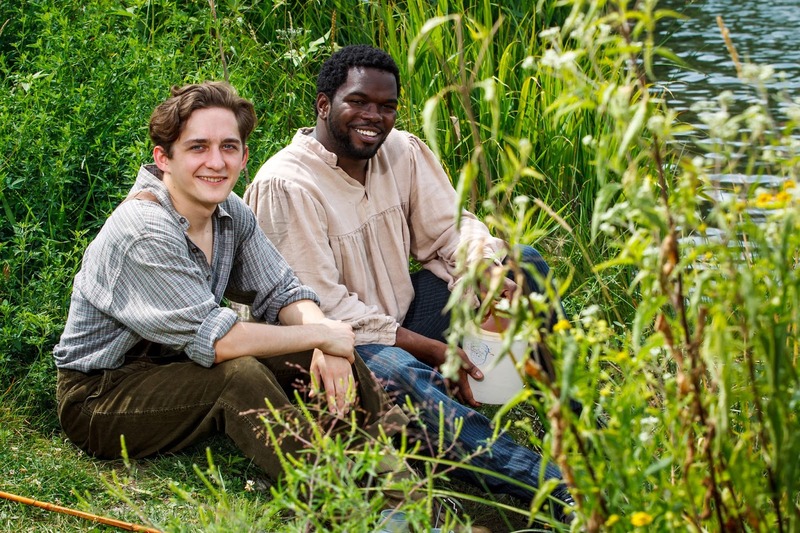 Actors James Romney in the role of Huck and Jonathan Butler-Duplessis in the role of Jim lead the cast of Theatre at the Center’s Big River: The Adventures of Huckleberry Finn through Oct. 15. 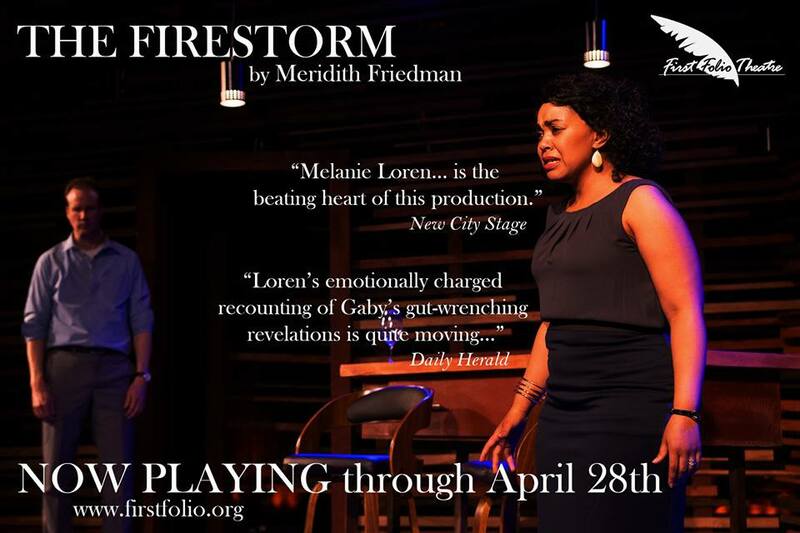 Performances are 2 p.m. Wednesdays and Thursdays; 7:30 p.m. Fridays; 3 p.m. and 7:30 p.m. on Saturdays; and 2:30 p.m. on Sundays, and select Thursday and Sunday evenings. Individual ticket prices range from $40 - $44. To purchase individual tickets, call the Box Office at 219-836-3255 or Tickets.com at 800-511-1552. Group discounts are available for groups of 11 or more and gift certificates are also available. 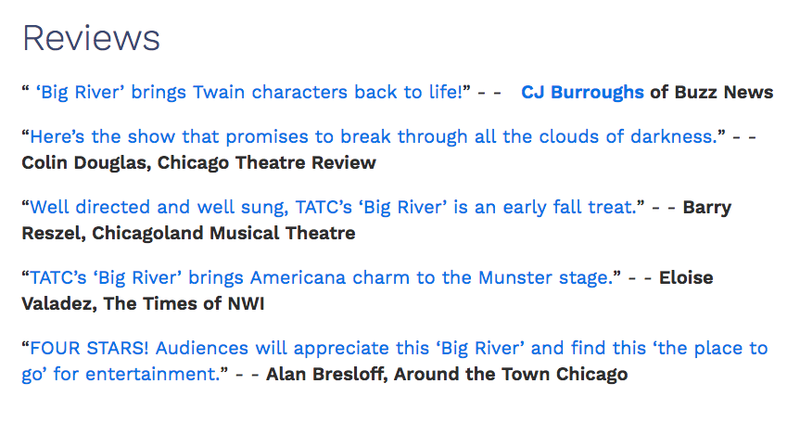 For more information on Theatre at the Center, visit www.TheatreAtTheCenter.com. Winner of seven Tony Awards, including Best Musical, Best Book and Best Score, this musical telling of Mark Twain’s treasured tale features songs and music by Roger Miller, who created such hits as “King of the Road” and “Dang Me.” Led by melodies of country, bluegrass and gospel, the musical production follows the humorous and harrowing river journey of Huck and his friend Jim as they meet up with con-artists, reunite with Tom Sawyer and encounter a collection of characters as only imagined by one of America’s greatest writers. 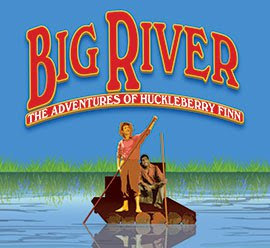 Based on Mark Twain’s 1884 novel, Adventures of Huckleberry Finn, the stage musical Big River opened on Broadway on April 25, 1985 at the Eugene O’Neill Theatre. 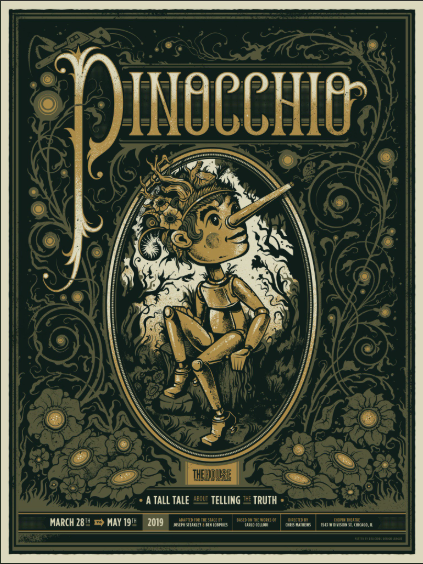 It ran for 1,005 performances and was considered one of the most successful musicals of the mid 1980s. Founded in 1991, the 410-seat Theatre at the Center is a year round professional theater at its home: The Center for Visual and Performing Arts, 1040 Ridge Road, Munster, Indiana. Theatre at the Center is the only professional theater company in Northwest Indiana, offering downtown caliber performances in an accessible venue with plenty of free parking. Theater at the Center is located off I-80/94, just 35 minutes from downtown Chicago.